Local Wildlife Sites (LWS) are areas in Oxfordshire and Berkshire which include important and rare habitats and species. The 42,000 LWS in England (covering 5% of land) are essential in conserving wildlife in the UK and halting the loss of biodiversity. LWS create a better connected landscape of wildlife buffers, corridors and stepping stones so that the countryside is more resilient to the pressures of modern living and climate change. LWS are protected from harmful development through the planning system but as most sites are in private ownership, their long-term survival depends upon the interest and goodwill of their land managers and owners. TVERC plays a key role in the survey, selection and maintenance of information on Local Wildlife Sites (previously known as Wildlife Heritage Sites in Berkshire and County Wildlife Sites in Oxfordshire). TVERC’s approach to LWS identification, mapping & designation is consistent with the approach taken in other counties in England and in line with the DEFRA guidance on Local Sites. 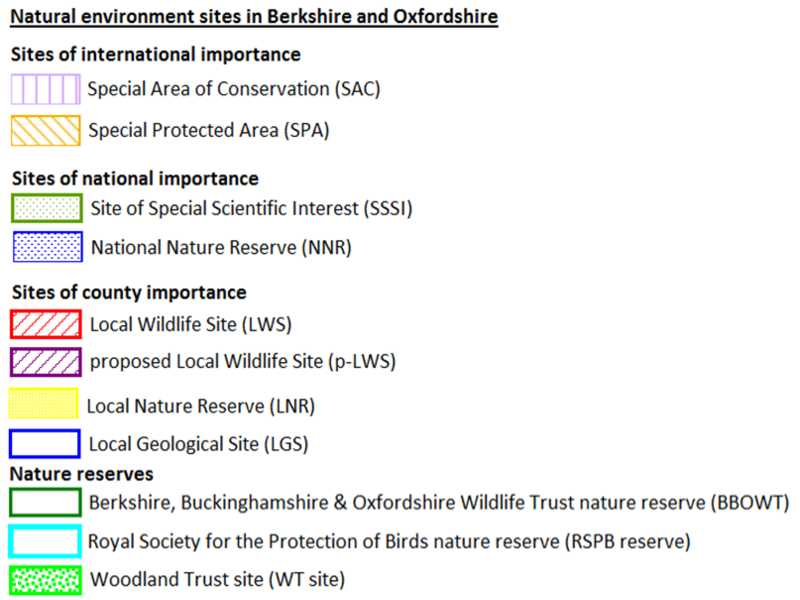 TVERC maintains a 'living list' of the Local Wildlife Sites in each local authority area in Berkshire and Oxfordshire, which is updated annually each May for the previous year. Local authorities are required by central government to identify, designate and protect these sites through the planning system. TVERC carries out the identification and designation of Local Wildlife Sites on behalf of local authorities in Berkshire and Oxfordshire. TVERC also reports annually to local authorities in Berkshire on how well LWS in their area are being managed. 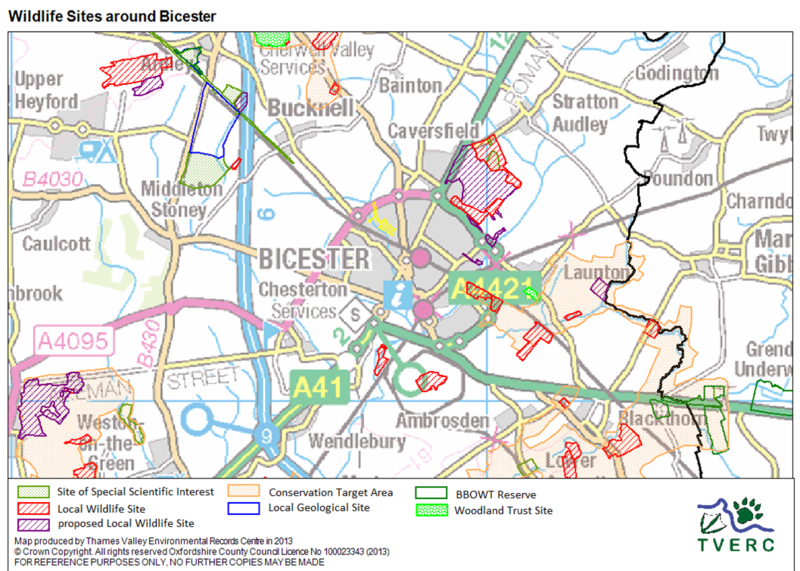 This information is used by local authorities in monitoring Local Plans, for corporate Biodiversity Action Plans and to report back to DEFRA on Single Data List requirement 160 “Proportion of Local Sites where positive conservation management is being achieved”. In Oxfordshire, this report is compiled by the Berkshire, Buckinghamshire & Oxfordshire Wildlife Trust. Landowners and managers of Local Wildlife Sites may be able to access funding and advice on how best to manage their LWS. In Oxfordshire, the Wildlife Sites Project officer based with the Berkshire, Buckinghamshire and Oxfordshire Wildlife Trust (BBOWT) can provide advice to landowners. Please see the BBOWT website for further information. In Berkshire, landowners may be eligible to apply to Natural England for agri-environment funding to help maintain and enhance biodiversity on LWS. Please see the Natural England website for further guidance. Landowners with woodlands can apply for support under Countryside Stewardship. All landowners and managers can apply for TOE grants. Survey work is carried out by TVERC staff and experienced volunteers, with the aim of surveying sites every 10 years. The information collected is used to assess sites against a range of criteria. A site selection panel meets during the year to assess the results of the site surveys. The panel comprises representatives from TVERC, the local authorities, BBOWT, Natural England and local wildlife recorders. Panel decisions result in sites being designated as LWS (if they meet the criteria), de-selected (if they don’t meet the criteria) or deferred (if further survey information is required). Sites remain designated as LWS and cannot be deselected until and unless sufficient evidence has been provided to demonstrate that they no longer meet the criteria. Landowners are made aware of these panel decisions. Once any remaining issues about the decisions have been resolved, maps of the location of these sites are distributed to local authority planning staff (as well as other TVERC partners) to ensure they are taken into consideration in the planning process.